I recently bought a small, quite fragrant cantaloupe at Sunset Valley Farmers Market. Entranced by the heady aroma, I ignored the unfortunate fact that I actually don’t like melons (watermelons being the irresistibly refreshing exception). This unabashedly ripe orb seemed to promise new possibilities of edibility. At the very least the baby could try it. Baby liked the new fruit just fine but my older son quickly decided he didn’t enjoy melon after all. And despite that honeyed scent I couldn’t put a piece into my mouth and my husband wouldn’t even feign temptation. What to do? Popsicles, of course! Now the whole family can dig these melons! 2 Tablespoons Amaretto–I spose this is optional. You could add a small splash of almond extract instead. fresh lemon and/or lime juice to taste–I used 1 small lemon and half of 1 small lime for my batch. local honey, to taste–I put in about 2 Tablespoons. Dump everything into your blender. Pulse to get it going then blend til smooth (or a little chunky, your choice). 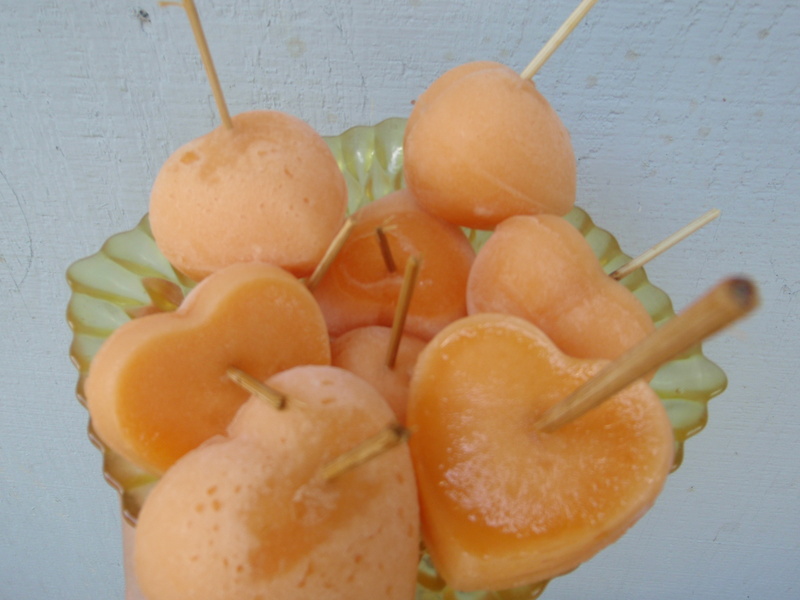 Pour the mixture into your popsicle molds and freeze for 1 hour before inserting sticks. Freeze until hard and unmold at eatin’ time. Astoundingly (to me) I do not own popsicle molds. I see such cute ones in stores and magazines. 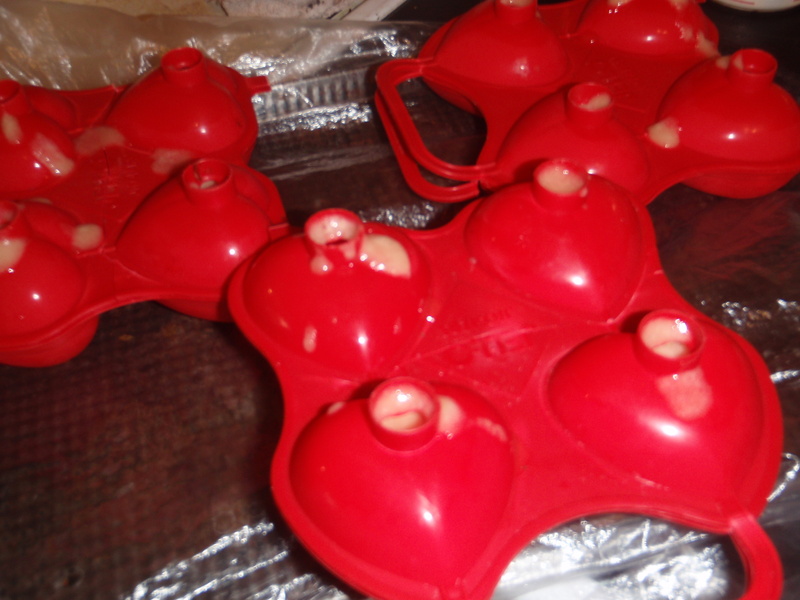 I probably own most every other kitchen doodad so I used some heart-shaped JELL-O® brand Jigglers® molds that I bought years ago at the (surprise, surprise) thrift store. You can use waxed paper cups but that’s not so green. If you don’t mind small ‘sicles ice cube trays will work and faster, too. Take advantage of a luscious local fruit, in abundant supply right now at good prices.